A must-have. Check it out now before huge lines form. Back in the spring, I wrote an article about a friend of mine’s budding little business called Good Food. At the time, Chef Julian Johnston was serving his out-of-control delicious sandwiches at the Cowfish, a local bar in downtown Eugene. The Bacon Chipotle Chicken sandwich and perfectly executed Cubano were among my favorites, and it would appear that they weren’t just mine. The combination of quality, locally sourced ingredients, tasty applications and incredible value led to consequential popularity. 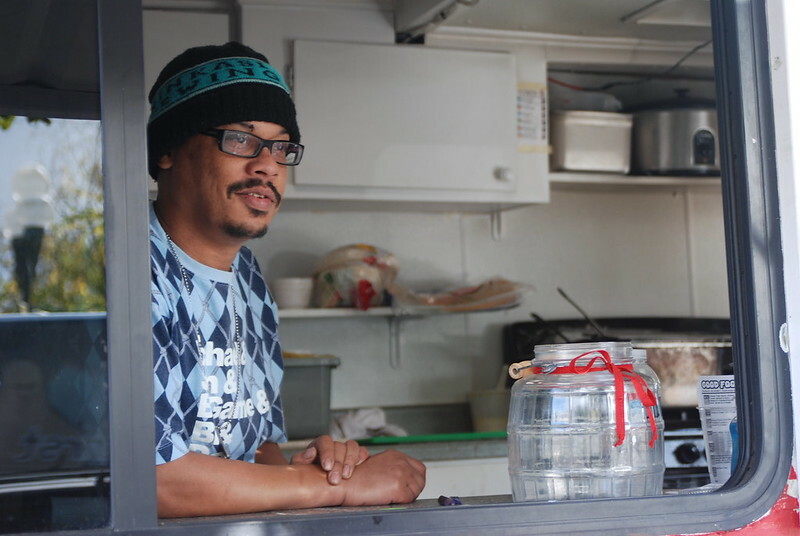 What’s more, it led to a glimpse of a possible future—starting his own food cart. Just six months after my initial write-up, I am happy to announce that his vision has materialized. Julian has partnered with fellow foodie Elliot Ladwig, and together they have taken to the streets to simultaneously fulfill their dream and the void that is your stomach at lunchtime. Located at 8th and Olive, the Good Food Cart is now open for business with a revamped menu that includes the established favorites as well as some brand new items that will take a sawed-off shotgun to your taste buds. Which, clearly, means that the food is good. 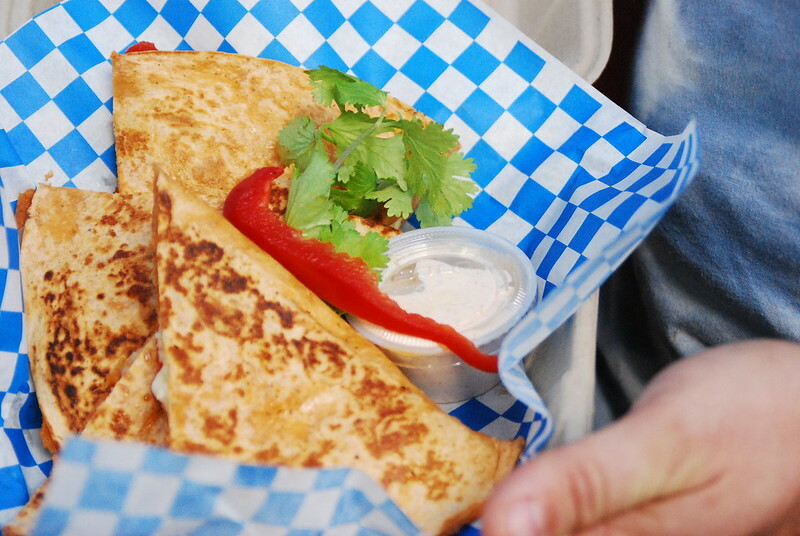 Introducing one of Elliot’s creations, the Roasted Sweet Potato Quesadilla. Appropriate for the fall and intriguing to say the least, this is not your average quesadilla. Served with chipotle lime sour cream, this dish combines oven roasted sweet potato, shallot, garlic, red bell pepper and Monterey jack cheese with a tomatillo tortilla. I honestly can’t say I’ve had anything like it before. Here we have Julian’s Espresso Braised Beef. 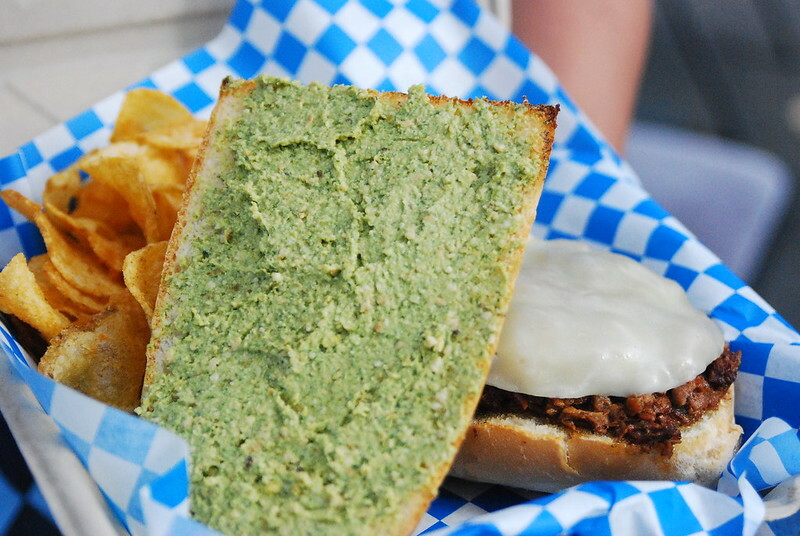 This is what happens when you take chuck roast, braise it in an espresso beef stock, and then slap it on a hoagie with a jalapeno-pesto spread and provolone cheese. This sandwich has been a local favorite since the very beginning, and it’s not going anywhere but down your gullet. For a food cart that’s just getting started, Good Food is doing a great job and I wish them well. The menu is simple and yet it has the just the right amount of culinary flair. As for the business model, it’s straightforward—good people serving good food at an extraordinarily fair price. If they keep doing what they’ve been doing, I’m sure they will have great success. Follow Good Food on Facebook for daily specials!